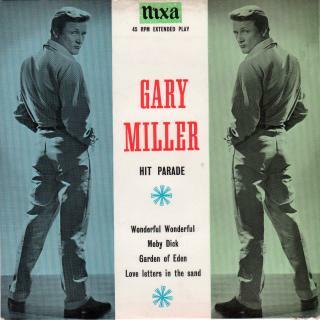 Gary Miller was a talented individual who could doubtless have made a career in any of several spheres. After completing his service in the Royal Navy after the war, he made the move south from his native Blackpool. It was his ambition to enter the teaching profession and in pursuit of this he enrolled as a student at a London college. However extracarricular activity soon found him singing- a hitherto undiscovered talent that led him away from his studies and towards making it as a professional entertainer. Gary is a difficult singer to categorise, because he sang such a wide variety of different material. His chart successes indicate that he was most suited to light 'pop', but he also sang a great many romantic ballads. He was the consummate professional, but despite his polished performances he never quite managed to break through into the top flight of British balladeers. The writer of this piece remembers seeing a live performance that Gary gave in March, 1958. Buddy Holly and the Crickets were top of the bill at the same show. Unfortunately, the Crickets were due to appear on the TV show "Sunday Night At The London Palladium" that same evening and had to go on stage first because of the timing of this appointment. Consequently, it was left to Gary to close the show. Despite having to deal with an audience still heady after a legendary performance by one of rock and roll's greatest stars (several people held up lighted matches during the rendition of Gary's latest release, "Put A Light In The Window") he came through the ordeal undaunted and to great applause. The EP on the left (NEP24047 issued in 1957) is one of no less than seven that Gary had released during his recording career. However he only had two albums issued and all his releases with picture sleeves are now quite hard to find. EPs are often a good way of getting hold of original tracks that were otherwise only available on 78rpm. For example, this record contains Wonderful, Wonderful, and The Garden Of Eden which were originally issued as 78s. Gary probably relied too heavily on recording covers of the songs of others and few of his best releases were without strong competition from well known singers. However, he managed to put something of his own into every one of them. Sadly, Gary Miller died from a heart attack in 1968. Note that Gary also had 78s issued on Columbia and Philips labels. 7N15151 was produced in the company of Marion Ryan and on 7N15140 he was accompnied by the Kenny Ball Jazz Band. Pye NEP24013 1956 "Four Big Hits"
Pye NEP24047 1957 "Hit Parade Vol.1" w.Tony Osborne Orch. Pye NEP24057 1957 "Meet Mister Miller Pt.1 -Onstage"
You're Nearer/Fella With An Umbrella/That's What A Rainy Day Is For/April Showers/Tott Toot Tootsie/That's For Me/There's No Business Like Show Business/"Footlights Rhapsody"
Pye NEP24058 1957 "Meet Mister Miller Pt. 2 -For The Young In Love"
Pye NEP24059 1957 "For The Young In Love" w.Tony Osborne Orch. Pye NEP24072 1958 "Hit Parade Vol. 2"
Pye NEP24123 1960 "Flower Drum Song"